A Growing Movement To Spread Faith, Love — And Clean Laundry Doing the wash can be a chore, but for the poor, the cost of laundry often means forgoing other essentials. 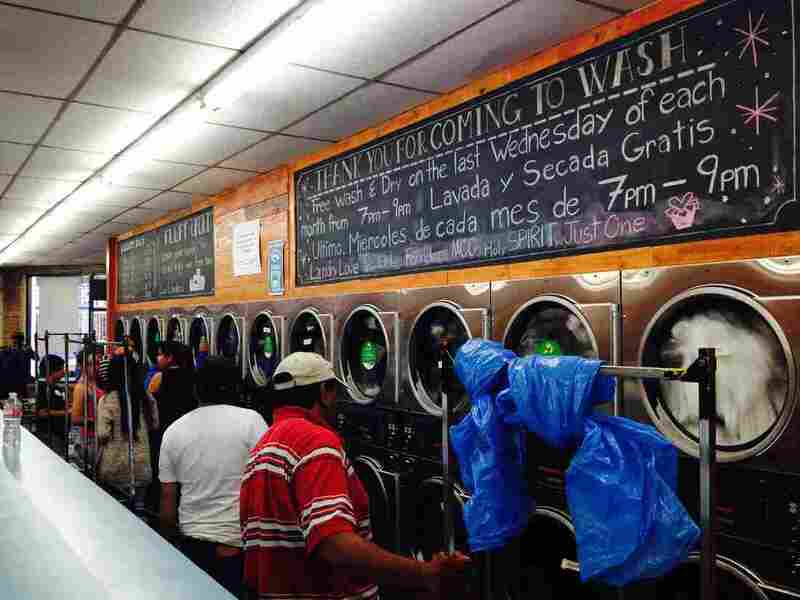 Laundry Love aims to relieve the burden with fellowship, free soap and lots of quarters. People who have come to do laundry with mingle with volunteers at a laundromat in East Hollywood, Calif. The Laundry Love initiative raises money to help the poor pay for the cost of laundry. It's 7 p.m. on a weeknight at a strip mall in Huntington Beach, Calif., and people have been lined up for hours outside a laundromat here. They've been waiting for a chance to do their wash for free. As they file in, volunteers direct them to the machines and help them to supplies. This is "Laundry Love" at work — a ministry that raises money to pay for detergent, dryer sheets and quarters for machines. Laundry Love gatherings may be the only time some people are able to wash their clothes, says volunteer Ken Kawamura. The idea for Laundry Love began at an Episcopal congregation in Ventura, Calif., and slowly but surely, it's spreading. Now, more than 70 churches, mosques and synagogues around the country have adopted the practice. For Giovanna Cortez, Laundry Love has become a necessity. With three kids, she has lots of laundry — and she lost her job in March. "I have to come because I have no money for laundry," Cortez says. She says she probably saved $50 last month by using the Laundry Love service. Shannon Kassoff, one of the organizers of Laundry Love in Huntington Beach, says it's about more than just free laundry. This group was formed by people who became disillusioned with traditional church, and started taking over this laundromat once a month. "This is our church," Kassoff says. "It is probably the best way to be involved in other people's lives, not just handing out food in a soup kitchen, or whatever. We get to know them very well, and that's probably the best part of this whole deal." David Clarke echoes that sentiment. Clarke never thought he would be on the receiving end of charity, until he lost his job as an aerospace machinist several years ago. He's been struggling to get by since, working part time at a grocery store. Laundry Love has become an essential part of his routine, and an opportunity for a night out. "It gives me the time to come and socialize with some nice upbeat people, and feel a little bit better about myself," Clarke says. The volunteers enjoy it, too. "I just like serving. Really, that's all it is," Ken Kawamura says. "I try to find things where people are ignored or also situations that people don't want to engage or, quote unquote, 'get their hands dirty.' 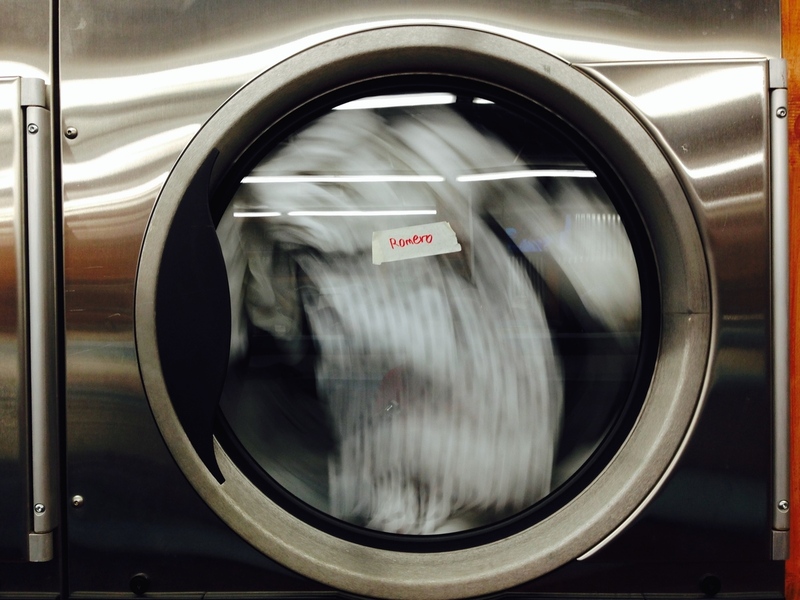 "
Practicing the Biblical commandment to serve your neighbor can seem daunting at times, says volunteer Shannon Kassoff — until you see the laundromat in action. "This is probably the most meaningful thing that we do, because we're taking our love outside of the walls of church," Kassoff says. "Bringing it to the people and sharing what we think is an amazing experience, and that's just love."